The election is over and the “next three years” have begun. Welfare reform, work on vulnerable children, the dictates of the international economy, and the likelihood of asset sales are all on the agenda. To get in early, we’ve writing a short letter about some of the current issues. Suicide figures for older people have increased 11% to a 10 year high. Overall suicide numbers are 558, the highest since 1997. Youth suicide rates continue to decrease, the 65-plus age group is growing, with 54 deaths this year – around 10 per cent of all suicides. Some nurses in rest homes think the real number could be much higher. We have more suicides in Aotearoa New Zealand than we have traffic deaths. Christchurch Women's Refuge is providing women access to a specialist family violence peer support programme in an effort to break the family violence cycle. It also has a temporary residential accommodation service for men removed from homes where women and children are at risk. Safe houses for women are still available. The new service is adapted from Auckland-based agency Shine’s safe@home service. Key partners are He Waka Tapu and Relationship Services. Domestic violence costs more than half a billion dollars a year in South Auckland alone, according to Tomorrow’s Manukau reducing family violence group. New initiatives for Māori family violence have been announced in Waitakere where Māori constitute 13% of the population, but 30% of family violence statistics. The project involves broad objectives to prevent family violence amongst Waitakere Māori overseen by Tatai Atawhai, a new family violence intervention prevention service for Maori called Awhi Whānau; a literature review by Cindy Kiro, and billboards promoting the importance of whakapapa featuring local kaumatua Pio and Chrissie Jacobs and their mokopuna. Lifewise Family Services has created the Awhi Whānau initiative which works with Western Refuge. Lifewise offers whānau long term social work support and therapy, and the Western Refuge helps Maori whānau at the beginning, crisis intervention stage. In the Bay of Plenty, Child Youth and Family and the Eastern Bay of Plenty Police Child Protection Team and Family Violence unit have been co-located to help improve outcomes for the victims of serious child abuse and their families. Between October 2010 and October 2011, the EBOP Police Child Protection Team and Whakatane CYF Office investigated 225 reports of concern under the Child Protection Protocol. Community Response Model Forums were established around New Zealand to engage work with communities on what services work and what supports were missing. Community needs identified include: linking communities so they work together and services are easier for families to access; encouraging providers to collaborate; better joint planning and funding of services which is flexible enough to adapt to changing community needs; and, community hubs, developed from what already exists (such as community houses, health centres or schools. More info can be found here. Government will redevelop almost 160 Glen Innes properties. The houses are part of the Tamaki Transformation Programme and only half will remain with Housing New Zealand resulting in a heavy impact on current residents. Residents have said "Our community has been together for years. Our children are going to be uprooted and put in different schools.” Community cohesion and stability is well known to be conducive to population wellbeing. Then there is the new Disability Innovation Fund making $500,000 available for getting people with disabilities into paid work or retaining them in work. The plan is to “sanction beneficiaries if their recreational drug use gets in the way of a job, cancel benefits for criminals on the run from Police, and have a new team of fraud specialists focusing on catching benefit cheats.” There will be extended data-matching with other government agencies. Benefits will be suspended for those who fail to appear on arrest warrants and can’t be found by Police. Even if the warrant is cleared, and the benefit resumes – there is no back-pay, a bit like the innocent being presumed guilty [surely this cannot be consistent with human rights legislation?]. “Beneficiaries with children will keep 50 per cent of their benefit until they supply evidence to show the warrant has been cleared. "– so beneficiaries get to reap the fallout from police mistakes. Maybe we’ve got this wrong, but it looks like - if drug use affects your work prospects, you can’t get either a job or get a benefit. So how do you get a legal income in order to eat? “If we do not start now to reduce very high youth unemployment and youth disengagement, New Zealand will face a ‘lost generation’ which will increase the risks of long-term unemployment, mental illness, suicide and associated negative social impacts.” Reject Youth Unemployment coalition (RYU) is a coalition made up of those affected by youth unemployment, concerned organisations, economists, academics and other individuals which aims to bring a community and youth voice to the issue of high youth unemployment and the lack of opportunities available for young people in New Zealand. Members include: Wellington People’s Centre, The Salvation Army, Stand Up (Youth Wing of the New Zealand Council of Trade Unions), New Zealand Unions of Students' Associations Te Roopu Ākonga o ngā Whare Wānanga o Aotearoa, Tertiary Education Union, and the Beneficiary Advocacy Federation of New Zealand. Church groups in Dunedin are working with the Occupy movement. Nationally, NZ Council of Christian Social Services president Ruby Duncan said she and 14 other members of her council support the Occupy protest. In Auckland, the Methodist Mission's Lifewise agency has provided food to the Aotea Square occupiers since the protest started last month. Church leaders challenged every election candidate standing to sign a pledge card which committed them to support policies to reduce income disparities (See candidates from 6 parties who did). Archbishop of York Dr Sentamu’s concerns about the ill effects of gross income disparities has been echoed by the Anglican Archbishops in this country, Brown Turei and David Moxon, and by the Anglican Church’s Social Justice Commissioner, the Rev Dr Anthony Dancer. 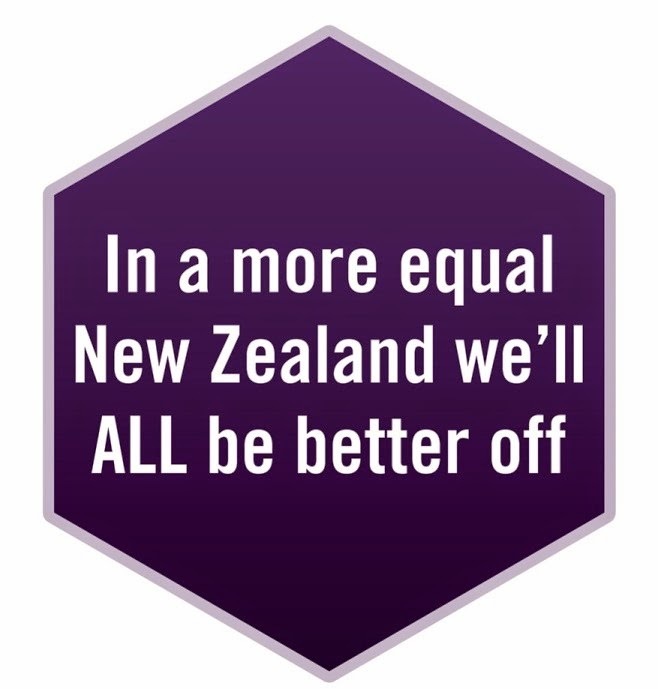 Here in Aotearoa New Zealand, the richest 1 per cent of the population owns three times more than the combined cash and assets of the poorest 50 per cent. National Health Board Review of Trends in Service Design and New Models of Care –a high-level overview of how pressures on health systems worldwide are influencing the current and future health services. The report does not represent Government policy, but instead outlines the ways in which health systems internationally are considering their responses to the challenges they face. Window on Waikato Poverty Poverty Action Waikato - Te Whakatika Mahi Pohara i Waikato The report is based on available regional statistical information, literature on poverty and the many interviews and conversations they have had with people locally, nationally and where possible internationally about the issues that are impacting on the most vulnerable people in Waikato communities. We Can – a group of people impacted by red zone decisions and by the machinations of the insurance companies have written An Open Letter to All New Zealanders. Find it here.